No one will deny that the oil in the engine of any car or motorcycle needs to be changed regularly. But what about the suspension? Just as the oil in an engine needs to be replaced as part of a maintenance plan the oil in a damper should be exchanged because as with the engine oil it deals with extreme pressure, temperatures and friction. With each stroke of travel, the smooth surfaces inside your suspension pick up microscopic particles of debris. Those particles are drawn into the oil and over time contaminate the interior passageways and valves. As the hours of use accumulate, so does the contamination. Without regular service, your high-performance suspension will begin to lose its ability to generate damping forces. 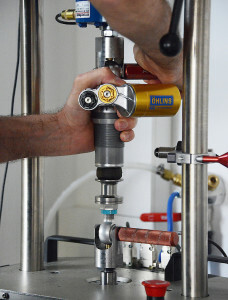 To keep your investment performing at the highest level, frequent servicing is necessary. 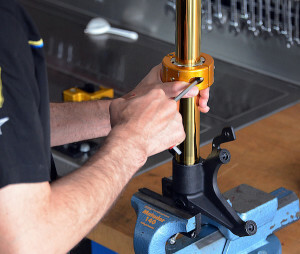 In our Öhlins service center in Brno your suspension is serviced to the manufacturer's desired quality level. Submit the service order request using the button below to access our on-line form. Please be sure to fill in all details and then use the butten “submit order“. After receiving your service order request we will contact you shortly via email with an estimate for the work. Please note that you will also be sent a suggested time for sending us the dampers. The dampers are inspected and then a final quotation submitted. In case of damaged or excessively worn parts, we will inform you of the additional charge and await further instructions before proceeding with the service. Servicing of products is in relation to exchanging seals and oil/gas only. All other items (for example: bushes, stickers) are treated as separate to the servicing work and must be requested as new at time of placing the service order. In case the product is heavily contaminated and needs to be cleaned to perform the service it will be cleaned and a charge will be added to your assignment. Special Offer from Öhlins DTC on Motorcycle products: extended 6 years warranty! To receive 6 years warranty on your motorcycle product, you should have received a warranty card at time of purchase. To qualify, it is important to have the product serviced regulary to have the warranty card stamped as proof of service. The service periods are 25.000 km for shocks and 10.000 km for stering dampers and front forks but latest 24 month after purchase. Each service needs to be registered in the warranty card coming with the product. Therefore, when sending in your motorcycle products for service please make sure to include this warranty card if you intend to benefit from the extended warranty cover. In case you did not receive such warranty card please let us know.